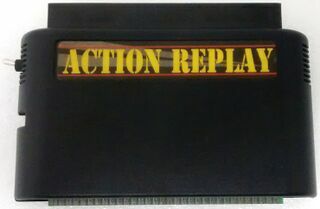 The Action Replay is a cheat device created for the Sega Mega Drive. It was originally released by Datel in the United Kingdom in late 1991, and was the latest in a line of cheat devices which continue to this day. The Mega Drive Action Replay was the first cheat device to be released for the console, pre-dating the Game Genie by the best part of a year. Unlike the Game Genie, however, no Action Replay cartridges were ever licensed or endorsed by Sega, though unlike rivals Nintendo, the company did not actively seek to prevent such devices from being sold. Several versions of the Mega Drive Action Replay exist and many more packaging variants were created, however the core functionality of the cartridge remains the same. In addition to the standard Action Replay cartridge, Datel released the Pro Version Action Replay (which introduced a cheat finding feature), Pro Action Replay and Pro Action Replay 2 (the latter sometimes dropping the "2", but otherwise includes some "built-in" cheats for popular games). 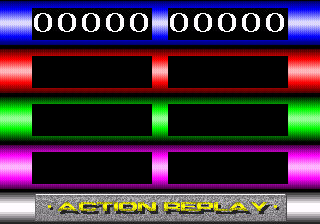 All versions of the Action Replay act as a pass-through device between the Mega Drive console and a game cartridge, intercepting signals and adjusting how the game runs depending on what codes have been added by the player. As a side-effect of this design, Action Replays also act as region converters, allowing Japanese games to be played on Western systems (likely a key part of its success in Europe). In addition, Datel provided regularly cheat books containing game codes. Unlike its Game Gear and Master System counterparts the Mega Drive Action Replay was released in North America, though was unable to find the same level of success as the Game Genie. Main article: Action Replay (Mega Drive)/Magazine articles. Main article: Action Replay (Mega Drive)/Promotional material.